I have a friend suffering with gerd and am doing research for her. This article is excellent and has to be passed along. by Chris Kresser, L. Ac. Note: this is the third article in a series about heartburn and GERD. If you haven’t done so already, you’ll want to read Part I and Part II before reading this article. Right after publishing yesterday’s article (The hidden causes of heartburn and GERD), I came across a new research (PDF) study hot off the presses that adds support to the theory that GERD is caused in part by bacterial overgrowth. Before moving on to my next planned article in the series, I want to take some time to review this study and discuss its implications. Malekzadeh & Moghaddam performed a retrospective study to investigate the prevalence of GERD in patients with IBS and vice versa. The data comes from a very large number of patients (6,476). To my knowledge it’s the largest data set that has been reported about the overlap between GERD and IBS. The authors found that 64% of IBS subjects studied also had GERD, whereas 34% of the GERD patients also had IBS. They also found that the prevalence of all functional symptoms (such as nausea, changes in bowel movement, headache, etc.) was higher in overlapping GERD and IBS subjects than the prevalence in GERD subjects without IBS or IBS subjects without GERD. This finding shows that in overlapping GERD and IBS, other functional abnormalities of the GI tract are also highly prevalent, suggesting a common underlying dysfunction. The authors even speculate that the underlying cause may be an overgrowth of bacteria. Specifically, they mention H. pylori as a possible culprit. I think they’re on to something! Assessing the role of H. pylori infection in GERD and IBS patients could be a target of future research, as in the present study the prevalence of H. pylori infection in GERD patients was found to be greater than in non- GERD patients. I believe that H. pylori infection plays a significant role in the pathogenesis of GERD and other digestive disorders. H. pylori is the most common chronic bacterial pathogen in humans. Statistics indicate that more than 50% of the world population is infected. Infection rates increase with age. 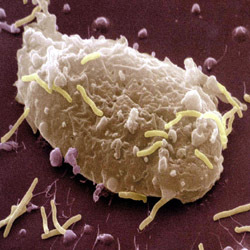 In general, the prevalence of infection raises 1% with every year of life. So we can expect that approximately 80% of 80 year-olds are infected with H. pylori. Second, we know that H. pylori suppresses stomach acid secretion. In fact, this is how it survives in the hostile acidic environment of the stomach, which would ordinarily kill all bacteria. Treating an asymptomatic H. pylori infection with antibiotics increases stomach acidity and eradicating H. pylori with antibiotics improves nearly all patients suffering from hypochlorhydria. Although it is commonly assumed that stomach acid production declines with age, recent studies suggest that the secretion of stomach acid doesn’t decrease with age and that the trend is actually to increase, especially in men. However, this tendency for acid secretion to increase with age is completely nullified by the corresponding increase in H. pylori infection. Since the incidence of H. pylori infection increases with age, it follows that hypochlorhydria also increases with age. If low stomach acid is a prerequisite to H. pylori infection, we might expect acid suppressing drugs to worsen current H. pylori infections and increase rates of infection. That’s exactly what studies suggest. Prilosec and other acid suppressing drugs increase gastritis (inflammation of the stomach) and epithelial lesions in the corpus of the stomach in people infected with H. pylori. A 1996 article published in the New England Journal of Medicine followed two groups of people who were being treated for reflux esophagitis for a period of five years. One group took Prilosec (20-40 mg/day) and the other underwent surgical repair of the LES. Among those who had documented H. pylori infections at the start of the study and who were treated with Prilosec, the rate of atrophic gastritis increased from 59 percent at the beginning of treatment to 81 percent by the end of the study. Among those who had no atrophic gastritis at the beginning of the study, 30 percent of those who took Prilosec later developed it. By contrast, just 4 percent of the surgically treated group developed atrophic gastritis. The connection between low stomach acid, h. pylori and acid suppressing drugs kicks off another nasty vicious cycle, similar to the one we discussed in the previous article. The increased risk of H. pylori infection caused by acid suppressing drugs is especially significant because H. pylori infection is associated with a small but significant increase in the risk of stomach cancer. I’ll have more to say about this in the next article. As I mentioned in the last article, fermentation of malabsorbed carbohydrates produces hydrogen gas in the intestines. Hydrogen gas is the preferred energy source for H. pylori. Elevated levels of hydrogen gas are also associated with other nasty bugs such as Salmonella, E. coli and Campylobacter jejuni, the leading cause of bacterial human diarrhea illnesses in the world. Excessive fructose, certain types of fiber and starch, and particularly wheat increase hydrogen production, and thus increase the risk of infection by H. pylori and other pathogenic bacteria. If you’d like to avoid heartburn, GERD and the many other unpleasant symptoms associated with bacterial overgrowth, it follows that you should minimize your intake of sugars, starches and grains. This entry was posted in Health and well being and tagged health. Bookmark the permalink.